Amanah Sisters are planning early this year for our Eid ul Fitr Picnic/Party and ask you to save the date on your calendars and hope many of our members can attend, in sha Allah. Every sister is encouraged to bring along a small gift to participate in our gift exchange. Keep it simple, let's see how creative we can all be with $5 or less. This is a potluck picnic, so if possible bring along a food/snack/dessert item to share with your fellow sisters. Insha Allah, we will be meeting inside the park at Douglas Kennedy Headland Section which features a boardwalk, picnic areas with a playground and splash pad nearby. This is a children friendly event, in sha Allah, some sisters will bring along some fun toys for them to play with. Spread the word and invite other sisters to attend as well. If you need help with transportation, let us know in the comment box, and insha Allah, some of our members can help you out. O Allah, keep me safe until Ramadan, keep Ramadan safe for me, and accept it from me. The following words are heard especially in Ramadan. Three day festival marking the end of Ramadan. It takes place on the 1st of Shawwal, the 10th month of the Islamic calendar. The ninth month of the Islamic (lunar) calendar. The meal taken before sun rise. 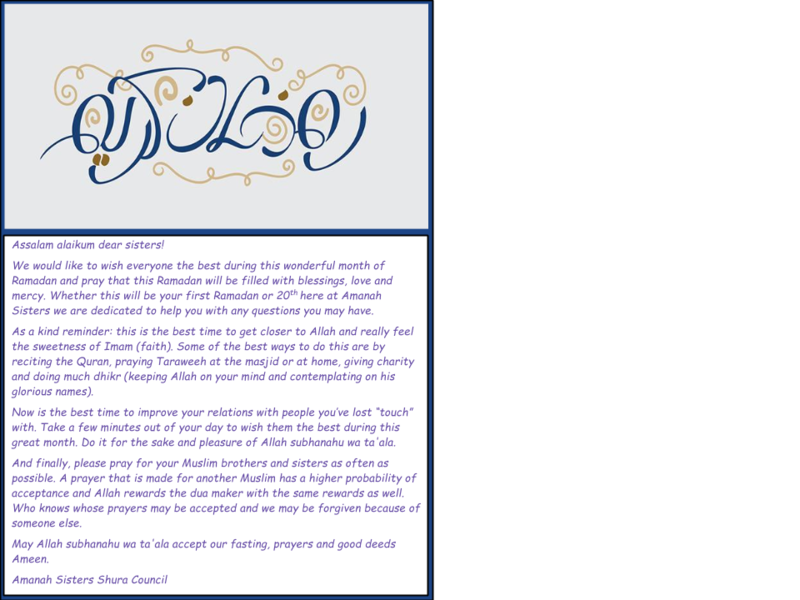 In sha Allah, we will be holding two halaqas during the month of Ramadan. July 2, and July 16 . Some of us may not be able to perform some or all of the fasting this month. This could be due to various reasons such as post-childbirth, breastfeeding, medical issues, etc. We then wonder how can we make Ramadan meaningful and beneficial? First recognize that this is by the design of Allah, swt. Not fasting for legitimate reasons is showing obedience to Allah. We should accept His decree and wisdom in this. It is not a time to be down, or sad, rather, embrace this time, and fill it with Faith-Boosting activities. Ramadan is a time to grow closer to Allah, which is certainly something we all can do, fasting or not. Non fasters just have to put their focus in areas other than fasting. Simple as that. We can excel in those other facets of Ramadan in sha Allah. Sisters all enjoyed welcoming Baby Boy and congratulating his Mom. A lovely selection of sweet and savory foods were enjoyed by all. the right to be worshipped except You. I seek Your forgiveness and turn to You in repentance." there are mistakes we ask for Allah’s Forgiveness and Mercy. This phrase is commonly used after reciting one of Allah’s Names. Amanah Sisters are pleased to invite you all to attend our Eid Ul Fitr Party. Click here to open your e-vite to our Eid Party Picnic. Ramadan Race: Click here to watch a short Youtube video about this app. Sisters present discussed the Next Halaqa. We have decided to hold it two days earlier for the following reason. One of our regular Halaqa attendees just had a baby and we wanted to ensure her participation and have a mini party welcoming her new son. the article from last week and went over the steps outlined in the succeeding 4 articles.